The desire to create a Customer-Centric culture has never been stronger. We are entering an era where great service isn’t simply a nice to have – rather it is essential in an environment in which poor service can destroy a business and great service can be your greatest differentiator. The digital world we live in ensures feedback is public, and more and more people turn to peer reviews to make buying decisions. The rise of Trip Advisor is the greatest example of the power of peer reviews, whilst this week United Airlines have seen almost $1bn wiped off their value, following passengers sharing a video of a man being dragged off a plane – quite simply, in a world where social media is king, poor service hurts like never before. Yet, should a customer-centric culture be the ultimate goal? As Brian Solis told us ‘Customer centricity is a culture of putting the customer at the centre of everything you do”. If great service is the key, why would you not make the customer your primary focus? However, perhaps the time has come to take a different approach. What if the true solution towards driving great service is not all about being Customer-Centric? Instead, what if true success stems from a culture of placing people at the centre of everything you do? Welcome to the era of being people-centric. 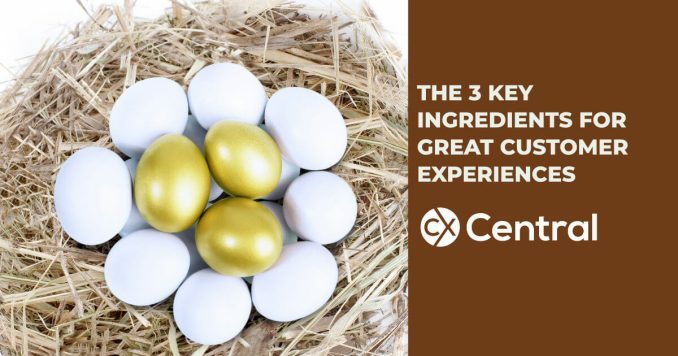 If you are looking to improve the CX in your business, make sure these key ingredients for great customer experiences form part of your CX Strategy. Whether it’s an airline, a supermarket or a bank, our customers all have one thing in common – they’re people. A focus on people doesn’t take away from a focus on customers. In fact quite the contrary. People that feel cared about, are more likely to about others. Google, Salesforce and Linkedin’s focus on people isn’t solely equitable. Indeed evidence highlights a clear correlation between Net Promoter Scores and people engagement levels. You will struggle to get happy customers if you don’t have happy people. Furthermore, we are in a day and age where consumers are holding company’s accountable for their ethical practices. We want to use those whose values align with our own. A company that genuinely places ‘people’ first becomes more attractive to the consumer they so desperately want to attain. Quite simply, placing ‘people’ at the heart of what you do is as much smart, as it is the right thing to do. Jag Randhawa’s excellent 2104 book, The Bright Idea Box, tells us how engaged employees are the true key towards long-term success – essentially that engaged people that feel part of something bigger will generate ideas that add value to both customers and the company. Indeed Schmidt and Rosenberg’s ‘How Google Works‘ tells us that the world’s most successful company feel the same way – that we are in an era where people make the difference, and that creating a culture in which ‘people’ can thrive is the pathway to success. Ultimately, a culture that drives innovation, continuous improvement and a desire to keep making a difference is instrumental if you want to maintain sustainable excellent customer engagement levels. Thus, placing people at the heart of any strategy is the real game changer. Jose Mourinho‘s quote gave us his view that quite simply, his then Chelsea team’s success would come from having the best players. Jose’s success over a number of years highlights that recruiting and then retaining people is what make the biggest difference to both short term and sustainable success. Yet we are in a world where employee retention is becoming an even bigger challenge than customer retention. Essentially we are moving from a world of ‘human resources’ into a world of ‘human assets’. A culture that supports the cultivation and retention of people is a must in a world where talent is in such hot demand. Unsurprisingly employees are just like customers – after all, we are all people. Thus, when Damon Richards tells us that ‘customers don’t care how much you know until they know how much you care’ is it any surprise that our employees also want the same thing – employers who first and foremost care? Regardless of what benefits and mechanisms are in place to drive people retention, showing that these strategies are in place because of genuine care for your people will be the key. Essentially, a failure to place people at the heart of what you do won’t only fail your people – it will fail all people – customers, shareholders, stakeholders and ultimately the company that any strategy has been designed to protect. People are the true value of the brand and creating a people-centric culture will ensure that businesses, as well as their people and customers, reap the benefits. The time has come to place people at the heart of what we do. If you need some helping in sourcing the key ingredients for great customer experiences in your business search our Business Directory – we have solutions including technology, consultants, trainers and more. David McQueen is the author of several articles that have been featured on both Linkedin, in the International Press and by several digital channels.